English is the main language of 94% of Surrey residents. Polish and Chinese languages are the most common other languages. 88.5% of people whose main language is not English can speak English well or very well. 1,000 residents of Surrey cannot speak English at all. In Surrey, 94% of people aged 3 and over stated that their main language was English. Nearly 65,000 Surrey residents gave another language as their main language. 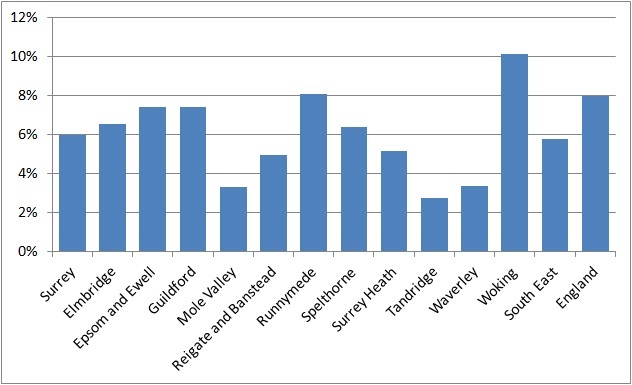 The borough with the highest proportion of the English speakers was Tandridge (97.3%) and the lowest was Woking (89.9%). Surrey has a higher proportion of English speakers than England as a whole, where 92% of the population stated that their main language was English. People who stated that their main language was not English were asked how well they could speak English. The options were: Very well, well, not well or not at all. 53.1% of Surrey residents whose main language is not English consider that they can speak English very well, and a further 35.4% can speak it well. Nearly 6,500 people cannot speak English well and a further 1,000 cannot speak English at all. The borough with the highest number of people with poor English skills is Woking where nearly 1,500 cannot speak English or can’t speak it well. Non English speakers in Surrey have better English skills than non English speakers in England as a whole where 79.3% of people whose main language is not English can speak English well or very well.